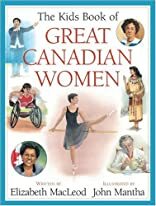 From artists and inventors to astronauts and engineers, Canadian women have played an extraordinary role in the development of Canada. In this title in the Kids Book of series, meet more than 130 women and read about their amazing feats in exploration, science, the arts, politics and many other fields. Some made their mark hundreds of years ago, while others are changing Canada today. In this groundbreaking overview, you'll find names both famous and less familiar. But every one of these great women needed determination and courage to succeed, and their stories continue to inspire. Kids can read about wheelchair athlete Chantal Petitclerc, who won five gold medals at the 2004 Paralympic Games; singer Sarah McLachlan, whose all-women Lilith Fair musical festivals raised more than $7 million for charity; and Harriet Brooks Pitcher, who made important discoveries in the field of radioactivity at a time when it was difficult for women to get a university education.